Swiss Chard or just Chard is actually an older leafy variety of beet or beetroot cultivated for the edible leaves, and closer to the original plant than those grown for their roots. There are several types of chards with varying leaf sizes, and varying leafstalk and midrib colors, from green, to yellow, orange and red. The vegetable’s scientific name is beta vulgaris subspecies cicla with the word cicla referring to Sicily where swiss chard first grew. Its popular name stems from the fact that a Swiss botanist determined the plant’s scientific name. Today, swiss chard is most popular in the Mediterranean. 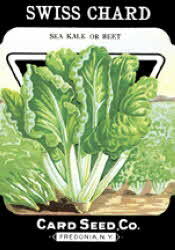 Swiss chard can also be found in northern Europe and South America.